Another week, another Cherry Mobile sale, right? This first week of September its going to be the Q1c QWERTY keyboard dual-SIM phone. It’ll be on sale for PHP 999, down from the original price of PHP 1,299 – a good 300 peso savings (24% discount). We still remember a time when we were surprised that phones could be sold for less than PHP 1k, but now Cherry Mobile has brought it to a newer level by giving you a QWERTY keyboard and dual SIM capabilities. 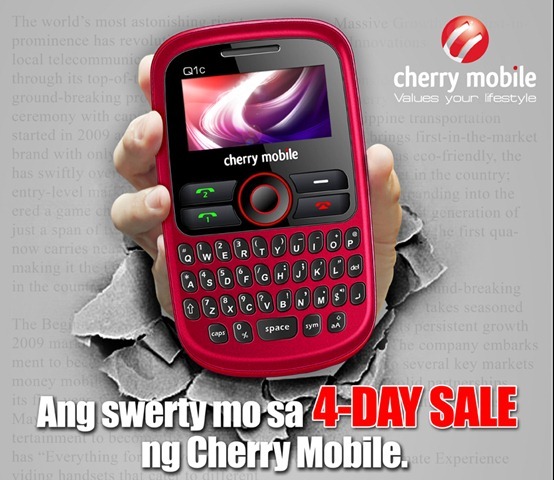 The sale only lasts until tomorrow though (Sep 1-4), so if you’ve been waiting for a Cherry Mobile QWERTY, better go out and get one. The Cherry Mobile Q1c looks like it’s a new product so let’s assume that this sale is it’s official introductory sale. It looks like its similar to the other Q1 phones but since it has a camera and other multimedia features we’re guessing the screen is colored. Whichever the case though, for PHP 1k it should be a pretty easy buy for a dual-SIM QWERTY device. So if you’re interested, pick one up today or tomorrow, September 4, when the sale ends. For a look at the whole flyer, click the image below. Hi Ronalyn, probably best to contact Cherry Mobile customer support for your needs. Hope that helps! hi there. apparently, madaling ma-lobat ang mga dual sim phones. even other cp brands. Hi, two antennas for SIMs will definitely drain batteries a little more but from our experience only to about 10-20% loss in standby time. It’s not too big of a deal so if you don’t want to bring more than one phone but have multiple SIMs, a dual phone is still a good way to go. 3.55mm jack po ba sya? and okay naman po ba yung music? Hi momo, I’m pretty sure it has the 3.5mm jack so no need to worry!